Here is a Malayan sun bear showing off his climbing skills. A couple of weeks ago, I was waiting in hospital (don’t worry, everything was OK), and my dad and I decided to research a new animal, so I chose the Malayan sun bear. They are the smallest species of bear, standing up to 150 cm tall and weighing up to 65 kg. Males are slightly larger than females. They get their name from the shape that is found on their chest which according to legend looks like the rising sun. They have loose skin on the back of the neck, so that if attacked it can turn around and bite back at their attackers. 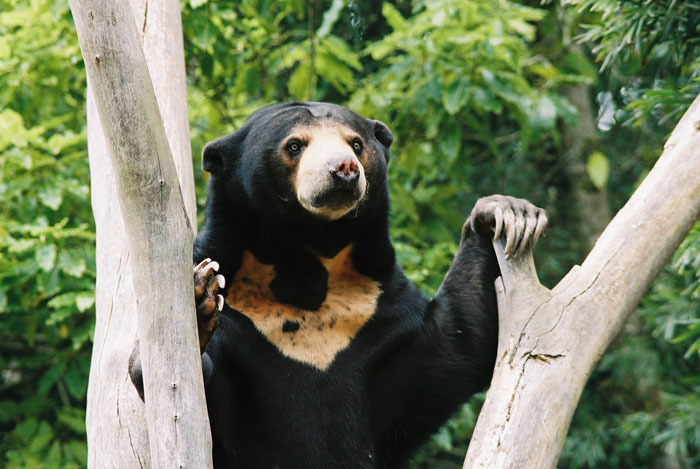 Malayan sun bears are omnivores and mainly eat ants, termites, honey and fruit. They have very long claws that are good for climbing trees and breaking into ant’s nests. They also have a very long tongue. They live in forests throughout south east Asia, including India, Burma, Laos, Cambodia, Vietnam, Thailand, Borneo, Sumatra and of course, Malaysia. They are vulnerable to extinction due to habitat loss and hunting. Are there any interesting facts that you would like to share about Malayan sun bears? They also have small ears and a short nose and that how she started getting called the dog bear! That is an interesting looking bear. THat’s cool!